Consumers often associate having insurance for their property with some level of financial security in the event of a catastrophe. Some wrongly believe that if something bad happens, their insurance companies will be on their side, ready to pay for damages and provide relief. However, insurance companies tend to do everything in their power to pay as little as possible. After all, they want to make a profit. Insurance companies are known to deny claims, insist policies don’t cover what the holders say they do, lowball offers and avoid disclosing additional funds for which consumers qualify. Insurance dispute lawyers work to straighten out relationships between the companies and the insured, helping clients receive the compensation they deserve. Nonetheless, as a policyholder, there are a few things you could do to reduce claim disputes with your insurance company. Under this provision, insurance companies can hire a contractor to perform repairs on your damaged property. In other words, instead of paying you money, they pay their “preferred contractor” for their services. This means the contractor works for the insurance company and not for you. Therefore, the contractor may take shortcuts, not fix items that should be fixed, or not perform the work to your standards, and you may have very little recourse against them. The right to repair clause can also be called “option to repair,” and it is usually found under the “loss payment” portion of policies. It may not be too late to back out of a raw deal. An insurance dispute attorney in Orlando, FL can help you review and understand all the details stated in your policies to determine whether it seems more convenient to stay with your current insurance company or switch to another one. A company including right to repair in its policy could be a strong enough reason to switch, especially if you can estimate that the money it would spend on repairs is significantly less than what they would owe you if they did not have the right to repair. Lawyers know that this clause is a powerful mechanism insurance companies use to save costs and shortchange policyholders in the claims process. 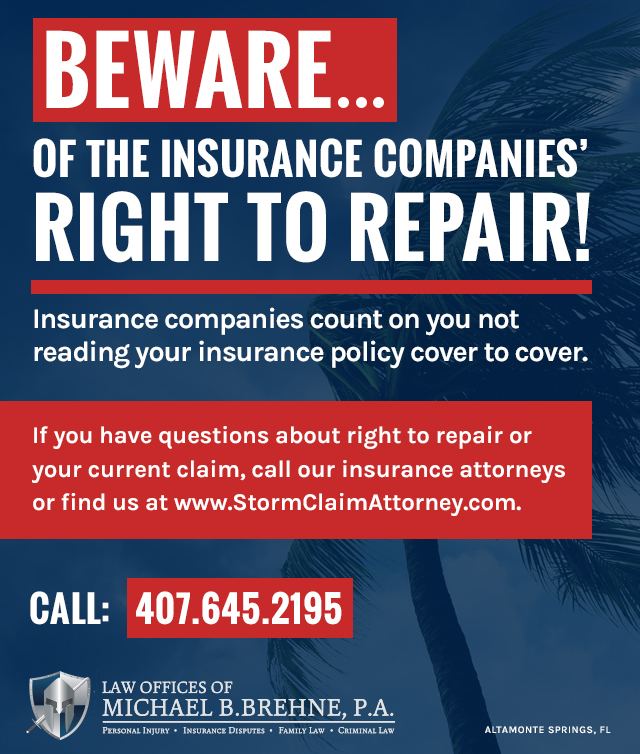 Even if you have already signed a contract with an insurance company that holds the right to repair, you may be able to salvage some of your claims with the required knowledge, resources and tenacity. An experienced insurance claims attorney can fight for your right to compensation and challenge insurance companies when they try to deny a claim too quickly. For example, when reading the “loss payment” section of a policy, pay attention to wording similar to, “We will give you notice of our intentions within 30 days after we receive the sworn statement of loss.” In some cases, if you were savvy enough to send in proof of loss, and the company was not savvy enough to give you notice within 30 days of its receipt, the company may be disabled from exercising its option to repair. Orlando insurance lawyers with the Law Offices of Michael B. Brehne, P.A. are trained to stand up to insurance companies that try to outsmart their clients and cut corners. Our team is qualified to help you review contracts and policies, explain terms to you and fight insurance companies to make them comply with their obligations when you qualify for a decent settlement. Call us today for a consultation.